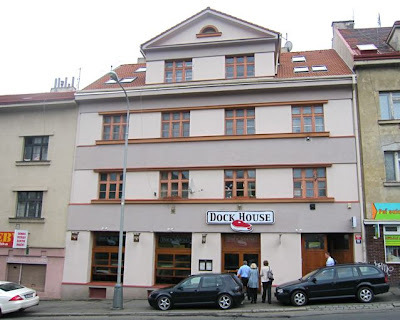 So my friend tells me he's heard that the restaurant, Dock House, has some of the best steaks in Prague. "Tell me more," I said. I listened carefully, even though he hadn't been there himself. He often gives me tips about restaurants Czech business people are buzzing about and that are usually off the beaten-track. He said it has unique interior that looks like the inside of a ship. The story he heard was that it was built by the previous owners to look like Noah's Ark. I didn't confirm that, but it certainly does. I was skeptical about trying the place, but I found the description intriguing. Then he said it was expensive. That didn't get inside my head as much as what he told me next. Prague 4 is one of the areas I've covered least. I've been feeling the need to fill in some of my geographical gaps. The only other place I wrote about in that district was essentially a cafeteria -- The Clubhouse in The Park in Chodov. 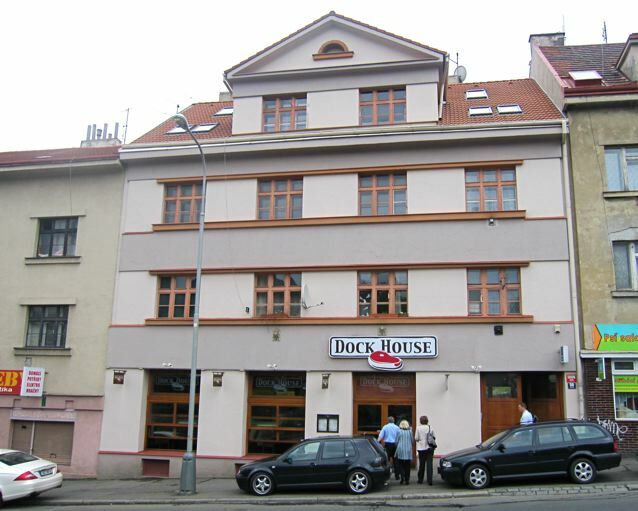 I looked on a map and the nearest tram stop, for the 11, is about 500 meters away from Dock House. I later figured out I could take the 139 bus from Vršovice. But that would still mean an uphill walk of about 250 meters from the stop. Anyway, I was feeling lazy, so I drove over. That made the journey easy, but it meant I wasn't drinking. 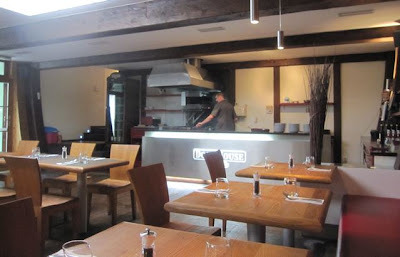 At the front of the restaurant is a small bar and cafe space. 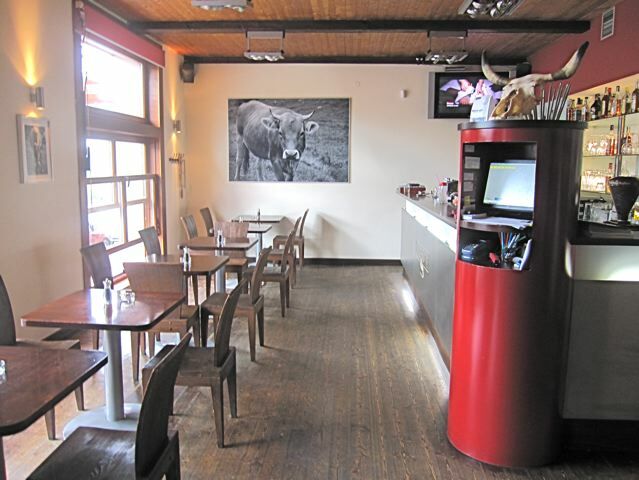 In the back was the more interesting space, with beautiful curving wooden beams, custom wooden furniture, and photos of cows on the walls. 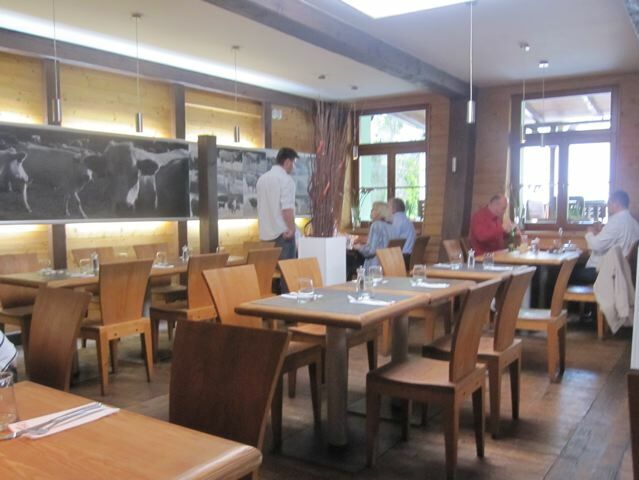 One side of the room was taken up by a chef presiding over an open grill. A friendly waitress asked what I'd like to drink. I asked for their homemade lemonade (48 CZK) and a bottle of Mattoni mineral water (42 CZK). 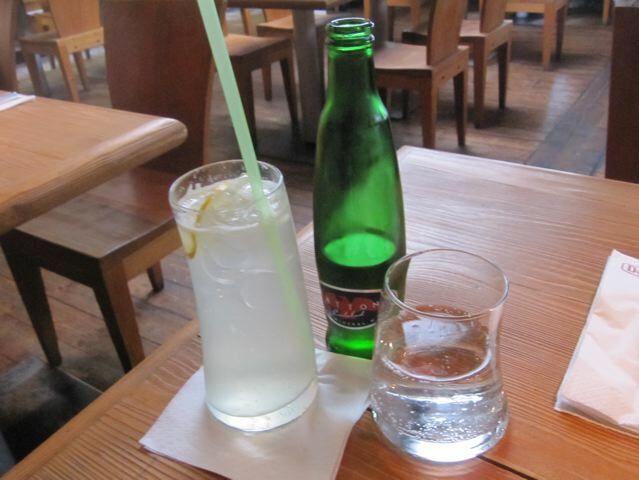 They serve the lemonade in stylish curved glasses. It was quite sweet and carbonated. I wished for more real lemon tartness. There was some pulp in there, but it didn't taste that different from a lemon soda you'd buy at the supermarket. 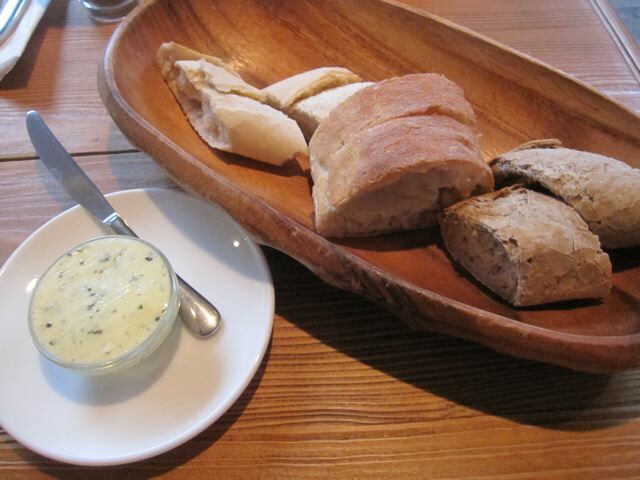 I received three kinds of sliced bread with herb butter. It wasn't warm, but the rustic bread in the middle was the best, with its crunchy crust and airy center. 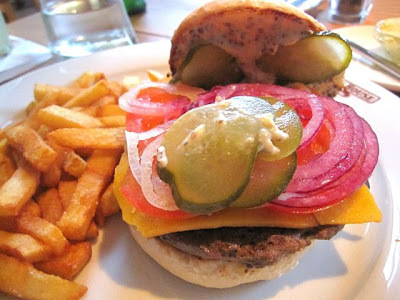 On this day, I wasn't in the mood for a steak, so I ordered the Dock Burger with fries (193 CZK). I had high hopes for a hamburger served at a place that prides itself on minced Charolais tenderloin, cooked over an open flame. I was sorely disappointed. This was the smallest burger patty I've ever seen in Prague, except for a regular hamburger at McDonald's. The picture doesn't really give good perspective on its size or the lack thereof. No wonder the menu said the Double Dock Burger was a "chef's tip." The 100 gram single was expensive enough, but the Double Dock goes for 288 CZK -- a dizzying price for 200 grams of meat on a tiny bun. The beef was cooked all the way through, despite my request for medium, giving it a toughness. I'm not sure how you'd cook such a thin burger to medium anyway. The flavor was not bad, but there was only the smallest hint of the grill. If this patty was made from a Charolais filet, I couldn't tell. The bun was loaded with toppings - onion, pickle, lettuce, and tomato, along with rather indistinct bacon. I asked for extra cheddar (25 CZK), which was not included on the Dock Burger. It was actually the real stuff -- very good quality cheese. But the whole effect was that all those things drowned out the ground beef. The plate came with good-quality steak fries, cooked golden and crispy, as I like them. A disappointing hamburger can make me all kinds of unhappy. But I've found a good chocolate fondant is the best cure. 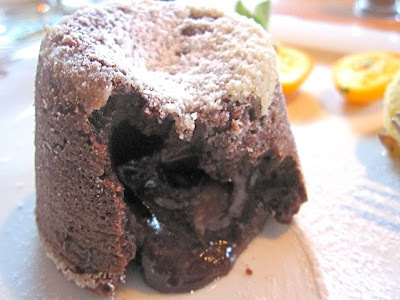 Dock House calls theirs a "chocolate souffle." (144 CZK) It took a while, which is normal because it was cooked to order. I am happy to report that it was great. 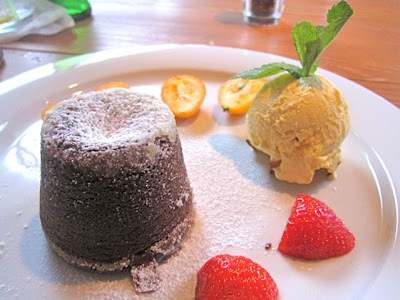 Not only was it filled with a generous portion of rich, molten chocolate, but there were even small chocolate chunks in there. So often in Prague, the ice cream that comes with these desserts is low quality and tastes totally artificial. Not in this case. Despite its too yellow color, the vanilla scoop had a smooth, clean and natural flavor that complemented the chocolate well. I should relate that the diner next to me ordered a steak medium rare. It was delivered medium-well. He pointed it out to the waiter and the improperly cooked meat was taken away. The chef watched apprehensively from across the room. The diner eventually received a properly cooked cut, but had to watch as his female dining companion ate without him. As for me, I found the service was good. I enjoyed the lemonade, the dessert, and the fries, but I wasn't satisfied. Especially after I paid 500 CZK, tip included. Of course, I had to come back for the steak. This time I tried to order the mint lemonade, but that wasn't available. 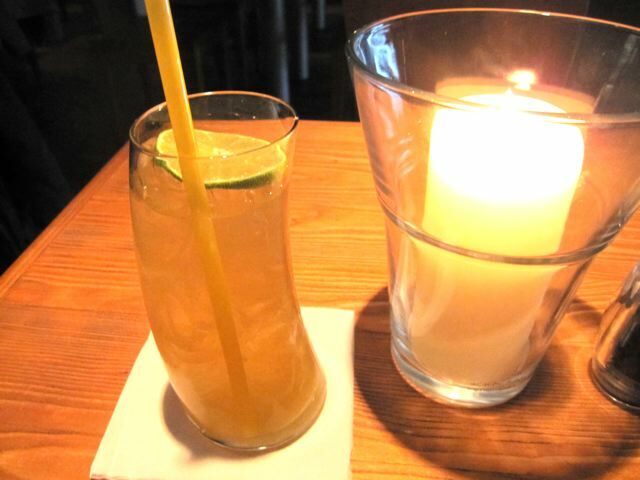 So I got the limeade (48 CZK). This wasn't carbonated. I liked it better than the lemonade, but did wish for more real juice in there. I decided to check on how they do seafood, so I ordered the "roasted" calamari (189 CZ). 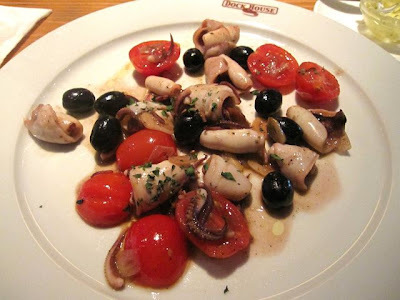 This time, my low expectations were greatly exceeded by the excellent squid, which were sauteed in olive oil. I savored their fresh flavor and tender texture. They came simply seasoned with cherry tomatoes, black olives, and sliced garlic. It was enough. This was one of the better calamari dishes I've had. The steaks come in three cuts, Charolais entrecôte, South American hanger steak, and Charolais filet mignon. The sizes range from 200 grams to 600 grams. I chose 300 grams of the cheapest cut, the entrecôte (393 CZK). I chose the demi-glace sauce to go with it. Other sauces were chili, mushroom, green pepper, herb butter, cranberry, or bacon and fresh tomato. Despite the big price, it didn't include a side item. 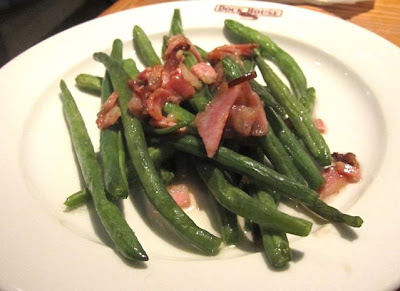 I got the green beans with bacon (65 CZK). The steak was very tender, and there was no question about its quality. 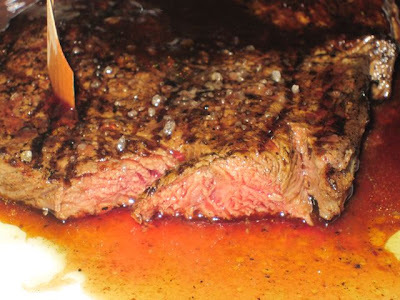 It was not very thick, but was cooked as requested to medium-rare. The only issue was the lack of salt. There were some rock crystals on the top, but it needed a strong shot of salt from me to bring up the flavor. It should have been properly salted just before cooking, not after. 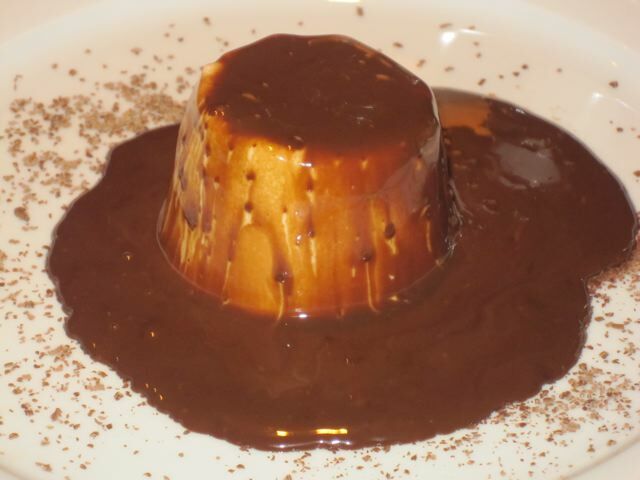 The demi-glace, a reduction of veal stock, vegetables, browned bones, also needed salt. However, it was excellent after the saline levels were brought up. It's one of my favorite sauces, and I'm still pining for the amazing version they used to serve at Cafe Savoy. The green beans were heavily coated in bacon fat. They were not overcooked, but they were rubbery rather than snappy and not as fresh as they should be. I'd had good luck with the dessert on the first visit, so I went for another one, the panna cotta with milk chocolate (144 CZK). I'd had a really bad, rubbery panna cotta when I had it at Pepe Nero. They should come to Dock House to see how to do it right. It was so smooth and creamy. The waiter poured real, hot milk chocolate over the top. Quality stuff. The chocolate overwhelmed the flavor of the cream underneath, but I still enjoyed every bite. My tab for this second solo trip was 900 CZK with tip. And there's the biggest problem with Dock House. 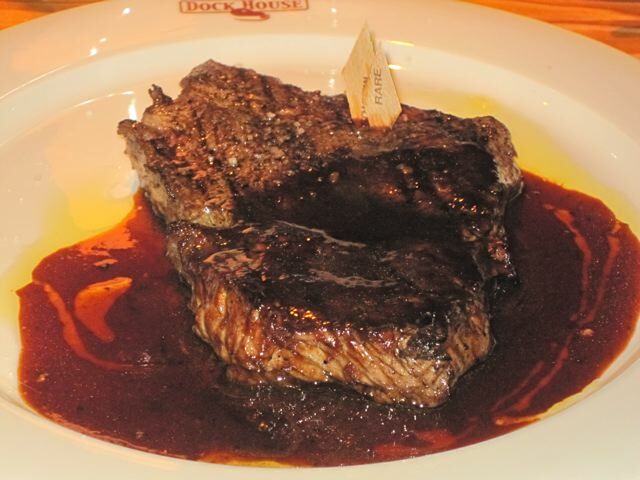 The prices are up there with or even higher than some of the other top steakhouses in Prague like El Barrio de Ángel, La Casa Argentina, La Bodeguita del Medio, or Crazy Cow. But given a choice, I'd take the 300 gram rib eye at El Barrio over the Dock House entrecôte, any day. El Barrio's steak is about 40 CZK cheaper, it's a thicker (entrecôte and rib eye are somewhat similar cuts), and it also gets a better smoky char from their grill. 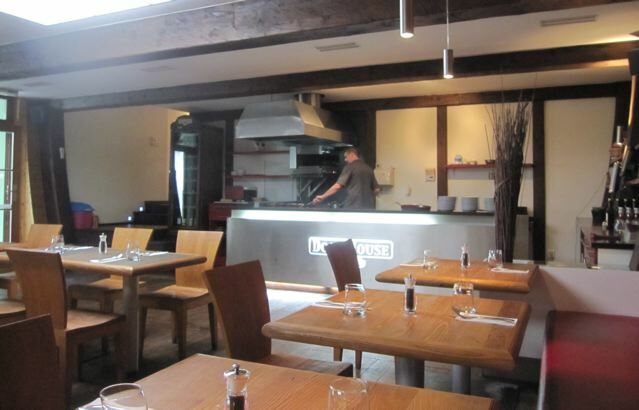 I really wouldn't mind trying more of the beef at Dock House. And maybe it's the best place in Michle. But I think it was the cost that hurt my wit. When I looked at the bill, I was not amused. Great that you are in Praha 4 again. You should try Domyno at Novodvorska, I think you would like it.